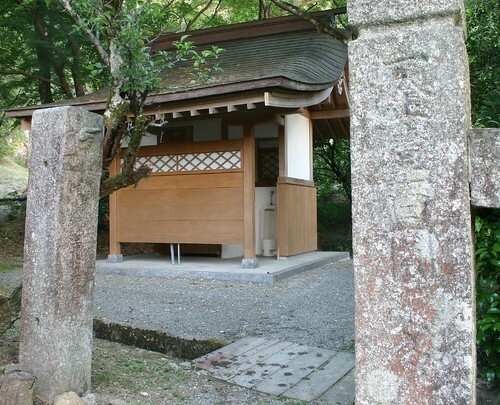 Like many toilets *for men* in Japan, the shrine toilet at Furukuma Shrine makes to attempt no conceal those that might urinate there. This photo was taken from the path to the shrine, so if one should take a leak then this would be quite apparent, in full sound and vision, to all those that are pass. Next to the church at Erce en Lamee in Brittany France there is a toilet which is similarly exposed but to an Anglo Saxon such as myself, the ability to see people urinating near a place of worship is something that I find almost shocking. In the UK men's urinals are considered to be dirty, smelly secret places that should be kept behind closed door. They are definitely not the sort of thing that one would want to see into on the way to church. As previously mentioned, toilet culture for men at least is quite liberated. Japanese youths are able to tell their parents about their bowel movements. Japanese males were able to pee on the street ("tachi shon") in Tokyo. And young males might invited each other for a pee together ("tsure shon"). But at the same time, Japanese females are these so ashamed of urinating that they would prefer to flush the toilet two or three times during the course of their evacuation rather than let others hear the noise. And as Sleepy days points out there are special electronic devices ("Otohime" or "Sound Princess ") that automatically, or at the touch of a button, emit a noise similar to that of a toilet flushing so that women can rely on the device to obliterate the sound of the tinkle rather than resort to flushing the toilet and wasting all that water. The reasons for this apparent contradiction will become apparent soon, here at burogu.com.